A good investor always looks for opportunity no matter the circumstance. If you can identify and invest in a winning long-term trend, your returns could be quite lucrative over time. 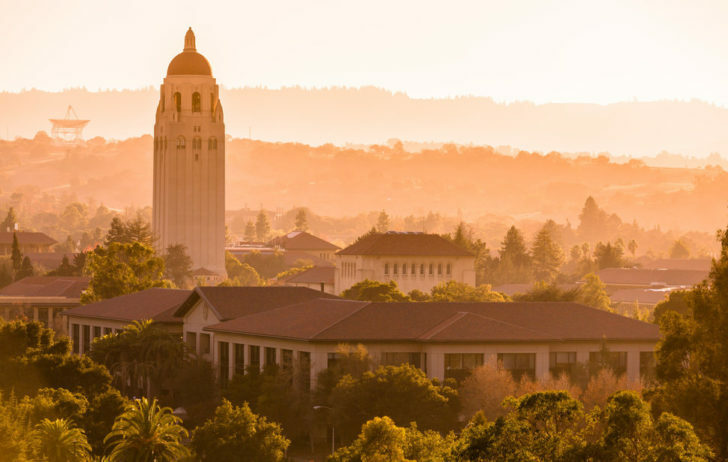 What I realized after the college admissions bribery scandal is that my effort to persuade the public to not spend so much time and money going to college, let alone an incredibly expensive private school is a losing battle. It is so obvious to me that paying record high tuition for a depreciating asset is not a wise financial move. Give me a $1 million check at age 22 over attending private grade school and university any day. Further, still spending 4-5 years to get a college degree when learning has become much more efficient thanks to the internet also doesn’t make sense. Two years should be enough to get a degree. Google makes doing research much quicker and easier than going to the library pre-internet days. Despite the obvious, when you hear about already rich and powerful parents spending hundreds of thousands of dollars to bribe their kid’s way into college, you know demand for college is inelastic no matter how much prices rise and how much the value of the degree depreciates. Further, the allure of a U.S. college education seems to only be growing in attractiveness to international students. To college chancellors, international students are the golden geese since most pay full price. Given there is an insatiable demand for a U.S. college degree, the easiest way to invest in this demand is through student housing. The investment thesis is similar to investing in San Francisco Bay Area real estate over the past 20 years based on the growth of major tech giants like Google, Apple, Facebook and the creation of new tech giants like Uber and Airbnb. They’re all paying big bucks and their employees need a place to live. I was too stupid to get a job at some of today’s most well-known companies. As a result, I just bought their stock and leveraged up and bought as much property as I could in 2003, 2004, 2007 (oops), 2014 and maybe something in 2019 as well. Overall, my SF real estate investments have returned enough to provide both my wife and me a simple retirement lifestyle. Therefore, perhaps investing in student housing in the face of college degree fever is also a wise move. Here are some positives of investing in student housing. 1) Relatively recession proof. When the economy turns down, more people go back to school. During the 2008-2010 financial crisis, MBA applications surged 50% for two years in a row. Part of the reason why I decided to get my MBA part-time between 2003-2006 was that I thought I might get fired by my new employer in the wake of the post-dotcom collapse. 2) Stability of cash flow. Whether in a bull market or a bear market, student housing supplies a reliable cash flow stream so long as the university is in good standing. We’re talking 99% occupancy rates when school is in session. 3) Enrollment continues to increase. Enrollment in postsecondary institutions is expected to increase 14% to 23 million by 2024, according to the National Center for Educational Statistics. As a result, rental rates are estimated to grow by about 2% a year according to Axiometrics. There are of course no guarantees when it comes to investing in student housing. We’ve all seen Animal House and know there can be some headaches when it comes to managing college students. 1) First-time renters with unestablished credit. Student renters are almost always first-time renters. Although you can hope they will be responsible tenants who will pay on time and take care of your property, you just don’t know for sure what they will do. Having a parent co-sign the lease is an absolute must. You’ve also got to properly vet the student’s parents. Hopefully, they’re really rich like all the parents who got caught in the bribing scandal. 2) More wear and tear on your property. Students drink and party, which results in excessive wear and tear on units. Sometimes they bash into walls when drunk. Sometimes they overflow the washing machine and cause the ground to flood. The more wear and tear, the more time and money it takes to maintain the unit. 3) Higher liability. Given students are considered more high-risk tenants, your rental insurance costs may be higher due to potentially higher risk activity. Sometimes college students like to throw bonfires on the balcony and accidentally burn your unit to a crisp. You just never know what newly free young adults will do away from their parents. I remember having a jolly good time when I was in college. 1) American Campus Communities (Ticker: ACC, NYSE) – ACC is the most established student housing REIT with a ~$6.5 billion market cap. They pay a ~3.8% yield and have done well over the past 12 months. 2) EdR – Was acquired in 2018 by Greystar Student Housing Growth And Income Fund for $4.6 billion, so that’s out. The other way to invest in student housing is through a private student housing REIT. I found one run by Rich Uncles founded in 2014. 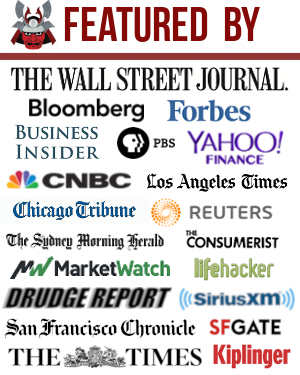 You don’t have to be an accredited investor and can invest as little as $5 on their platform. Their Student Housing REIT (BRIX REIT) only buys student housing within a one-mile walking distance of major NCAA Division I universities that have at least 15,000 enrolled students. This seems like a prudent precaution as some smaller, less well-known universities are facing lower enrollment figures and are at risk of shutting down. All properties purchased in the Student Housing REIT must have a minimum capacity of 150 beds, feature 90%+ rental occupancy rates; and represent a broad spectrum of geographic locations. What I like about the Rich Uncles REIT is that there is no broker/dealer fee that public REITs charge and they have a good performance fee structure. The first 6.5% of any profit is paid out to shareholders with no fees. All profits after 6.5% are split 40% to Rich Uncles and 60% to you. This performance alignment with shareholders is my favorite type of fee structure. Unfortunately, as of April 16, 2019, Rich Uncles told me they’ve closed their BRIX REIT (private student housing REIT) to new investors because they’ve had too much demand. As an alternative, RealtyMogul, founded in 2012, has some good student housing real estate opportunities that appear on its platform from time to time. I’ve met the founder and CEO, and like that she’s focused on a long-term, sustainable business with high quality control. Of course, no investment offers guaranteed returns, so please do your own research before investing. The long-term demographic trend towards more people going to college is a nice tailwind for the student housing sector. As a parent now, I realize parents are willing to do anything for their children to get ahead. Spending big money on education seems to be the solution if you can’t spend time educating your children yourself. The growth of international student demand is positive as well. They won’t discover until decades from now that a college degree from an American university isn’t worth what it used to be. Although student housing seems like a wise long-term investment, I wouldn’t want to actually physically own and manage the student housing. Turnover and maintenance would be major headaches. The only way I would invest in student housing is through a public or private REIT. Let the professional managers deal with rowdy students and let us earn income passively. Readers, what are your thoughts on investing in student housing as a long term investment? What hiccups do you foresee? Any other publicly traded student housing REITs you are aware of? What other ideas do you have for profiting from the college admissions scandal? For those who have investments in ACC or Rich Uncles, I’m curious to hear your thoughts, especially negative ones. My daughter lives a few blocks off campus at Univ of Texas in Austin. She refused to live in a dorm and wanted to live in an apt or what I consider a “private dorm” complex. She is in a four bedroom apt (each room has its own bathroom) and there is a common living/dining/kitchen area that is nicer than most new homes. The rent is $1,100 a month per room; $4,400/ month for this 1,200 foot apt is printing money for the private REIT that owns it. The place is brand new and has amenities like a gym, business center, infinity pool, etc – The best way to describe it is a cruise ship on land. It is gorgeous, brand new, fully leased with a waiting list AND the kids cannot lease it without their parents signing the lease. ACC also owns many of these in Austin and I don’t worry about UT drying up but I don’t think ACC is regional and likely has exposure elsewhere. Sam, Rich Uncles looks to be barely generating enough cash from operations to cover expansion and obviously is throwing off a hefty loss with depreciation & amotization; I’m not sold on that but am “all in” on the college housing concept. So I directly own student housing and it is pretty great. As enrollment goes up well placed houses will see their rent increasing significantly. Yeah their is wear and turnover but students pay a lot for the houses so it balances out. The biggest downside is that they never pay on time. Its mostly because 6 people or so will live in a house and you always end up with one troublemaker leading you to chase them down for rent. Some college towns are deserted over the summer. Unless you require a one-year lease (which could make you look less desirable as a landlord), prepare to not collect rent during the summer. This happened to my ex-landlord. She wanted a yearlong lease, didn’t see enough interest so she had to use shorter leases and dealt with an empty rental over the summer months. That being said, I did consider the BRIX REIT. Seems like a fine choice for people who want to take advantage of the trends you mentioned without dealing with the pain of housing undergrad students! This must depend on the location because students in our college town were used to seeing one year leases. The leases typically ran from August 1 through July 31. I’m thankful for all the previous landlords that set the tone for how student leases worked in our town! I lived on campus during college in dorms that were built decades ago, which was good for walking to class, but not so great lifestyle wise. I was jealous of the students who lived off campus in apartments and had more freedom and privacy. Lots of great points you bring up in this article. Sounds like a unique way to diversify. I didn’t realize REITs specific to student housing existed. I agree with not wanting to own directly but through a REIT of some sort. I chair a small college board and we’ve been recently warned about an enrollment “cliff” approaching in 2020 due to national demographics and a Harvard Business Professor predicts half of the colleges in the US will close or go bankrupt in the next decade. Those projections would make me cautious about targeting student housing unless it is directed at premier institutions that are the most likely to survive and even perhaps thrive. I think that is where you are indicating the best opportunities are, the same kind of places that the bribery scandal encompassed. The lower the tier and reputation of the schools, with community colleges at the bottom of the pile, the more likely they will be to struggle. Those schools also do not attract wealthy foreign students to the same degree due to lack of prestige. I think your ideas of growth in student housing and a possible dire future for lesser colleges are completely compatible. Not that my opinion matters in this area. And unfortunately I’m associated with one of the least likely to thrive. I think that’s true, hence why it’s important to invest in D1, large institutions that are gathering all the fruit and likely to be around. The no-name small colleges that chart hefty tuitions will be feeling a lot of hurt over the next 20 years. As someone who has been involved with academia a long time, I think you are ahead of the curve with your doubts about the long-term value of traditional higher ed, but maybe behind the curve in expecting demand for student housing to increase substantially over the next 5-10 years. Enrollments may indeed increase, but there is so much teaching happening on-line already that I expect within the next decade that students will rarely need to be on campus at all. More students will commute in once or twice a week, or even just do classes completely on-line, thus reducing the demand for housing close to campus. Just my opinion, of course, but I would be wary of investing in campus housing due to the coming wave of campus tele-commuting. Soon even some professors may not need to live near campus! Great point about more folks doing more online work. But would you say it’s the lower tier colleges that are allowing students to do more online work and not come to class? Yes, I think it’s definitely the lower tier but also some of the big public ones (I know for sure that UCLA is moving that way, for example). It’s more the private schools, especially the elite private liberal arts ones, that are resisting the on-line movement. I’m an auditor at a top 10 public university and we did a recent audit of distance learning education. Our state’s goal is to have 60% of its population college educated. The state has provided significant funding to the university to allow it to develop and offer online degrees but there are also state regulations to prevent the “supplanting” of existing courses which is a way to promote that students continue taking residential courses. Being a top 10 public university there isn’t a concern that enrollment will go down and the university has kept enrollment limited to about 50,000 students for the past ten years which, I think, creates even greater demand. The college years were some of the best times of my life and I think it would be unfortunate for young adults to miss out on it for the sake of saving money. Students get so much exposure to different activities, hobbies, culture/arts, and people, which can shape their future and lifelong friendships that the cost of this is priceless. I just don’t think an online degree would provide a similar experience. I purchased a one bedroom condo virtually steps from campus in 2006 and have had the most ideal student tenants. Rents were higher than other places in town but the students seemed very focused on their studies and were willing to pay a premium to be able to easily get on campus. With all the students directly depositing monthly rent into my bank account, I sometimes forgot that the condo even existed. Unfortunately, I can’t say that I made a good investment since the purchase was in 2006 at the height of the housing boom. The condos do meet the 1% rule based on the price of recent units sold and I wouldn’t hesitate to purchase another unit today. I hope over the long term schools can work towards online work or more specialized, shorter degree programs. It would sure cut down on the agregious amount of student loans out there going forward. But…I don’t see an incentive to do so, most colleges have thousands of employees making good money who will fight like hell to make sure their “accredited” programs require a 4 yr degree where students spend at least half of their time learning material that has nothing to do with their specialization. The non-profit standing will not get in the way of people trying to make money, in my opinion. When my cousin went to USF in 1971 my uncle bought him a house in the Sunset District for $30K sold it last year for $1.6 million……. Must be nice to get gifted and become a millionaire! What does your cousin plan to do with the $1.6M? Student housing is a fantastic asset to own. There are many property management companies that will be able to take the burden of management off of an investors shoulders. Even if you don’t use a management company, there are a lot of things you can do to easily mitigate your risk. Another interesting thing about student housing is that not only does it do well during a recession, but the cap rates tend to go down during the upswing in the economic cycle. So you get to play on both sides of cash flow and appreciation. I actually work for a company that specializes in student housing on both the management side and acquisitions side. Even in my own personal investments, my student housing property has materially out performed my stock investments since 2012. You have listed some negatives with renting to students including no credit history (although can probably be mitigated by guarantees by parents), more wear and tear and higher liability. I would imagine there is also the higher turnover rate as well. I am interested to know if there is a premium for renting to students. Does that premium overweight the negatives? I am also curious to see the appreciation difference between housing close to campus vs. ones further away. As you move away from campus (over 1 mile) the valuations start to drop off pretty drastically. We only invest in those properties that are within 1.5 miles, with a focus on the <1 mile range. 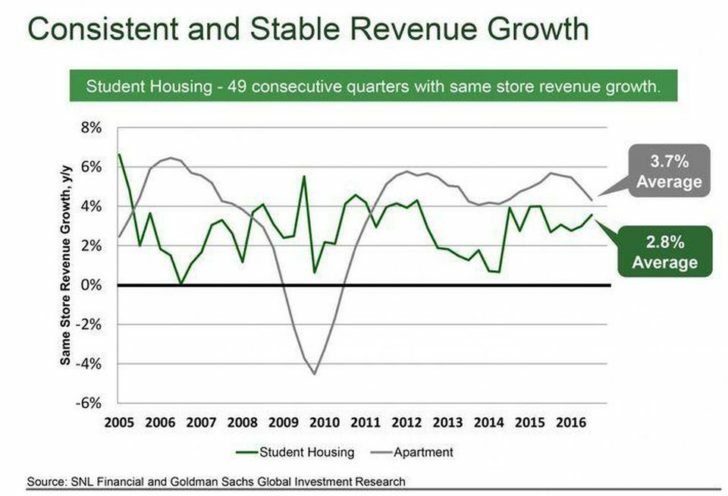 However if the market has a strong job market, the assets that are further away begin to blend from just pure student housing into student housing + recent grads. So there definitely is value in those properties, but they probably just aren't going to be 100% student projects and therefore you'll need a slightly different strategy. Big ups on the REIT recommendations. I’ll look into them in my IRAs. They’re the way to go to maintain a passive investment style and get exposure on a potential rising area within real-estate. I think that’s a great idea. I will check out ACC. It sounds like a REIT I can invest in. Our old condo was near a university. Many parents purchased a unit for their kid and sell them afterward. I think it’s a great investment if you can swing it. Student housing is expensive. Why not invest in real estate instead? Agree completely with letting professionals build and manage the housing. They will also have the resources to do thorough research and build housing in prime locations that individual investors may not be able to touch. Looked at buying a multi-unit near a large campus where I didn’t have expertise. Good thing the deal fell through, as a brand spanking new 20 story, 500 unit building went up in a much more prime location. 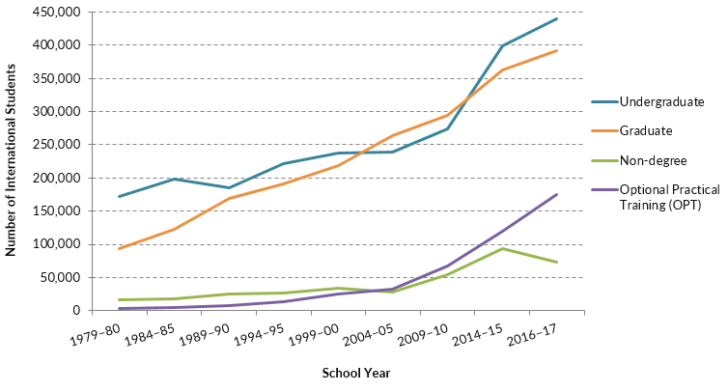 Since then, rents in the neighborhood of the would-be purchase have fallen substantially. Just highlighting risks in addition to the rowdy students and first time clueless renter! When I was married I bought two condos (both I lost gladly to the ex during the divorce) that were next to a major prestigious college campus. I thought along the similar lines you have back then about the constant demand for housing by the local college students. I actually got away with it relatively easy without any major trashing of the place (primarily because they were 1 BR condos so partying would be much harder there). But I discovered I did not like to be a landlord as the annoyance factor did not make the money I got from it worth it (both condos after income tax, mortgage payments, etc probably gave me the equivalent of reading 2 CTs a month). I do like the idea of REIT type investment in the arena like you pointed out. My parents almost bought a property near the school when I was getting my undergrad. The idea was that I’d use it for 4 years, and when I graduated, my cousins would use it too. The family members/students/renters would keep the non-family member student renters in check. It ended up not happening, but it might have been a good idea just because of the appreciation that properties in that area have seen. My cousins ended up going to different schools though so who knows. I wouldn’t want to deal with college students though. “Give me a $1 million check at age 22 over attending private grade school and university any day.” I completely agree with this, not sure if my 22 year old self would have the discipline to use it the right way though. Also student housing is a super interesting niche real estate investment. I would love to see more REITs in this space doing value-add investing.